HE Indigo Bunting’s arrival at its summer home is usually in the early part of May, where it remains until about the middle of September. It is numerous in the eastern and middle states, inhabiting the continent and seacoast islands from Mexico, where they winter, to Nova Scotia. It is one of the very smallest of our birds, and also one of the most attractive. Its favorite haunts are gardens, fields of deep clover, the borders of woods, and roadsides, where, like the Woodpecker, it is frequently seen perched on the fences. It is extremely active and neat in its manners and an untiring singer, morning, noon, and night his rapid chanting being heard, sometimes loud and sometimes hardly audible, as if he were becoming quite exhausted by his musical efforts. He mounts the highest tops of a large tree and sings for half an hour together. The song is not one uninterrupted strain, but a repetition of short notes, “commencing loud, and rapid, and full, and by almost imperceptible gradations for six or eight seconds until they seem hardly articulated, as if the little minstrel were unable to stop, and, after a short pause, beginning again as before.” Baskett says that in cases of serenade and wooing he may mount the tip sprays of tall trees as he sings and abandon all else to melody till the engrossing business is over. The Indigo Bird sings with equal animation whether it be May or August, the vertical sun of the dog days having no diminishing effect upon his enthusiasm. It is well known that in certain lights his plumage appears of a rich sky blue, varying to a tint of vivid verdigris green, so that the bird, flitting from one place to another, appears to undergo an entire change of color. The Indigo Bunting fixes his nest in a low bush, long rank grass, grain, or clover, suspended by two twigs, flax being the material used, lined with fine dry grass. It had been known, however, to build in the hollow of an apple tree. The eggs, generally five, are bluish or pure white. The same nest is often occupied season after season. One which had been used for five successive summers, was repaired each year with the same material, matting that the birds had evidently taken from the covering of grape vines. The nest was very neatly and thoroughly lined with hair. 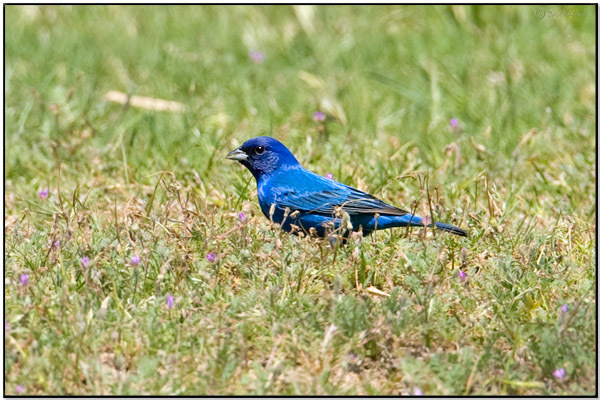 Indigo Buntings are in the Grosbeaks, Saltators & Allies – Cardinalidae Family. What a difference between the two as the article said. The Lord gives protection to the female by her coloration so she can sit on the nest and not be noticed. Praise the Lord for His care for the critters and us. The Indigo Bunting communicates through vocalizations and visual cues. A sharp chip! call is used by both sexes, and is used as an alarm call if a nest or chick is threatened. 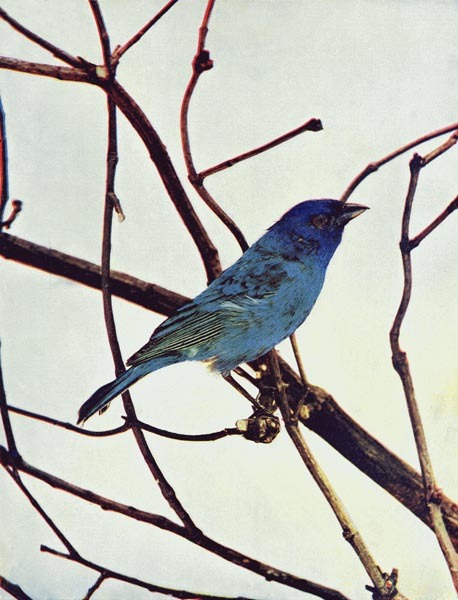 A high-pitched, buzzed zeeep is used as a contact call when the Indigo Bunting is in flight. The song of the male bird is a high-pitched buzzed sweet-sweet chew-chew sweet-sweet, lasting two to four seconds, sung to mark his territory to other males and to attract females. Each male has a single complex song, which he sings while perched on elevated objects, such as posts, wires, and bush-tops. In areas where the ranges of the Lazuli Bunting and the Indigo Bunting overlap, the males defend territories from each another. Migration takes place in April and May and then again in September and October. 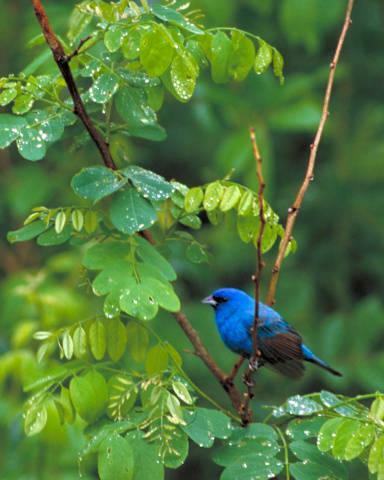 The Indigo Bunting often migrates during the night, using the stars to direct itself. In captivity, since it cannot migrate, it experiences disorientation in April and May and in September and October if it cannot see the stars from its enclosure. These birds are generally monogamous but not always faithful to their partner. In the western part of their range, they often hybridize with the Lazuli Bunting. Nesting sites are located in dense shrub or a low tree, generally 0.3–1 m (1–3 ft) above the ground, but rarely up to 9 m (30 ft). The nest itself is constructed of leaves, coarse grasses, stems, and strips of bark, lined with soft grass or deer hair and is bound with spider web. It is constructed by the female, who cares for the eggs alone. The clutch consists of one to four eggs, but usually contains three to four. The eggs are white and usually unmarked, though some may be marked with brownish spots, averaging 18.7 × 13.7 mm (0.7 × 0.5 in) in size. The eggs are incubated for 12 to 13 days and the chicks are altricial at hatching. Chicks fledge 10 to 12 days after hatching. Most pairs raise two broods per year, and the male may feed newly fledged young while the females incubate the next clutch of eggs. 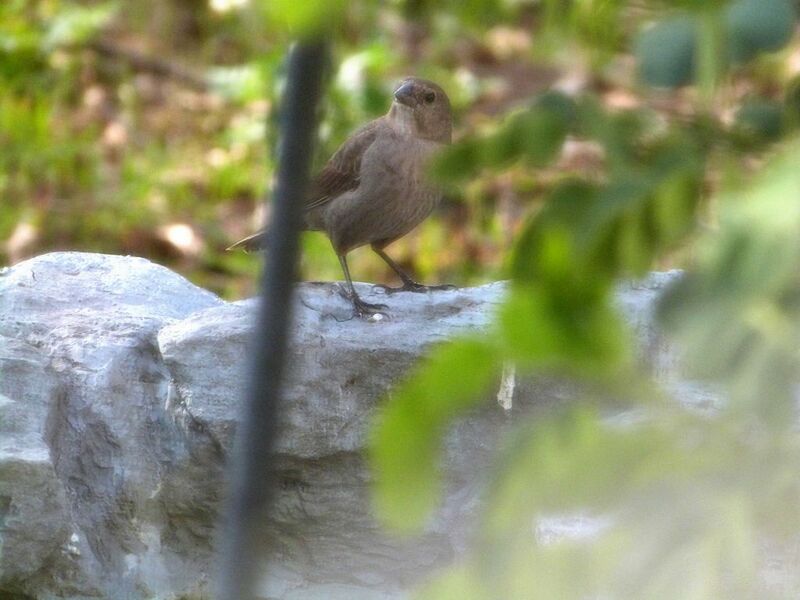 The Brown-headed Cowbird may parasitize this species. Indigo Buntings abandon their nest if a cowbird egg appears before they lay any of their own eggs, but accept the egg after that point. Pairs with parasitized nests have less reproductive success. The bunting chicks hatch, but have lower survival rates as they must compete with the cowbird chick for food. 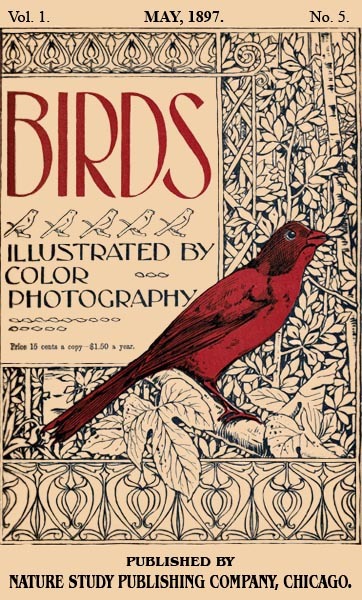 This entry was posted in Birds, Kid's Section and tagged Birds Illustrated by Color Photography, Birdwatching, Cardinalidae, Christian, From The Past, Home School, Kids, Nature, Photography, Vol 1 #5 May 1897, Youth. Bookmark the permalink. I love to see the indigo bunting. I think I have only seen it once, and that was near Roanoke, Virginia. With regard to Nature Study PubIishers, I have a set of 52 cards of American birds. A 1 – 13, B 1 – 13, C 1- 13, and D 1-13. Very lovely (but anatomically inaccurate) drawings of birds from vermillion flycatcher to a Bobolink. Would anyone like them?